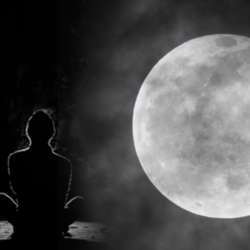 As the moon is connected to spiritual practices, it is very good to meditate on a full moon day. Moreover, the moon has an effect on water and our body is approximately 70% water. Hence on the day of Purnima or full moon it is beneficial to do meditation. How does the moon affect our body? The food we consume is converted into 2 parts – mind energy and prana or life force. The mind energy is centered in the pineal gland area from which vital hormones get secreted. It is believed that the moon enters this gland and takes control of all our activities - from night till the time we awaken. The rays of the moon affect human beings, animals, plants, water and so on. As our bodies consist of 70% water, the full moon meditation helps the seekers in going inward, transcending the mind, and experiencing the divinity within. We will start the session with some breathing exercises to calm our mind and than do a guided meditation from Sri Sri Ravi Shankar.